I came to painting late. As a youngster I went to Saturday classes at the Chicago Art Institute and as a young adult did some figure drawing. But then children plus a career in academia put a stop to that. It wasn’t until the end of the 1980’s, with retirement around the corner, that doing art again could become a reality. I started taking classes at the Evanston Art Center: some print-making, some drawing, and finally, thanks to Eleanor Speiss-Ferris, figure painting in oil. What a discovery! In class after class, Eleanor pushed me and pulled me, never withholding the hard truth, but always encouraging. Then the Kougeas Gallery in East Boston offered me a one person show, which took place from March 7 to 28, 1998. 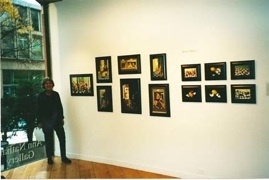 In the fall of 1998 I began showing at the Ann Nathan Gallery in Chicago, where I remained until 2012. Chicago brick buildings, old radiators, crooked shades, checkerboard floors and the like. I think I could choose the title of “Disconnections” for most of my little figure paintings. Why disconnections? It seems to me that being “connected” or not connected is a basic issue these days. In some ways, we appear to be more connected than ever: to our headsets, to our cell phones, to our computer games, to our e-mail, to our videos, etc. That’s all pretty easy. But how are we connecting to each other? Surely we spend significant amounts of time in the same physical space as others. But do we experience connection, or do we experience disconnection, as in a kind of Sartrean “No Exit”? I think that my paintings are an attempt to work through some of these issues in a personal way. Much as I’d like to, I can’t begin to explain or account for this approach to painting in terms of my past or present. I suppose if I could explain, I wouldn’t have to paint. People sometimes mention that my work brings to mind Balthus and Hopper. I am enormously flattered, of course, since these are two of the painters I most admire. But whatever my sources – personal or exterior – making these images has brought me joy and satisfaction. Now it is up to each viewer to react on his or her own terms. This website was designed and constructed by Ben Mittman, to whom I am grateful.